What’s day-to-day life like with Bohring-Opitz Syndrome? My day-to-day life is very different than I imagined when I was expecting. Because of Hazel’s special needs, I feel like we are stuck in the infant stage for years rather than months. Being stuck in a developmental stage for longer than normal has its similarities and differences from the typical parent’s journey. Because Hazel doesn’t grow and develop at the normal pace, she has different requirements. Children with BOS tend to have sleep issues, and Hazel sleeps very late. She often doesn’t get up until 9 or 10 o’clock in the morning. While she sleeps, I’m able to work, which is a blessing. But it certainly makes getting out of the house at a decent hour impossible! We have to make sure all of our appointments are in the late morning or early afternoon to accommodate. Hazel needs help holding her bottles and gets spoon-fed all of her meals. We are working on self-feeding, but this is slow going. Finding adequate childcare for Hazel has been a challenge. I enjoy working part-time from home as a research librarian and have looked for a part-time daycare outside of our home so that Hazel can have a little socialization. However, we don’t feel that typical day care centers can give her the one-on-one attention she needs, and I have yet to find a recommended home daycare that doesn’t have an extensive waitlist! Hazel has a low immune system and catches colds very easily. Colds are devastating for her, knocking her out for a week or more while her body heals. The risk of shared germs is a huge concern for us, as well. Currently we have a part-time nanny that comes to the home and is great for the intensive assistance and stimulation that Hazel requires. The cost of a nanny is one of our largest expenses and I wish we could afford more hours. There are times when I think we could put Hazel in a daycare center to free up some money, but I haven’t found the solution for this yet. The nanny feeds Hazel her lunch, takes her for walks, and works on her developmental exercises. Some days Hazel is more engaged than others. Some days she sleeps for hours, as if she’s making up for a night of insomnia. It always seems like she takes these monster naps when we have somewhere to be! Some afternoons, I take Hazel to physical or occupational therapy. We have recently reduced the amount of sessions she attends, because it was taking a toll on me and we weren’t seeing huge gains by having her attend 5-6 different lessons each week. After life settles down and we get our childcare situation a little more under control, I will concentrate on increasing the therapies that I feel are most beneficial to her. Hazel is not very mobile, and spends a lot of time on a blanket in the middle of our living room, surrounded by her toys. She’s a little vocal, but not very often. Some days she’s engaged and plays, and other days she is withdrawn and not very attentive. I still do not know if this is seizure activity, or what’s going on in her brain when she’s not very responsive. When I’m around a typically-developing child, I see how exhausting it would be to chase around a toddler! 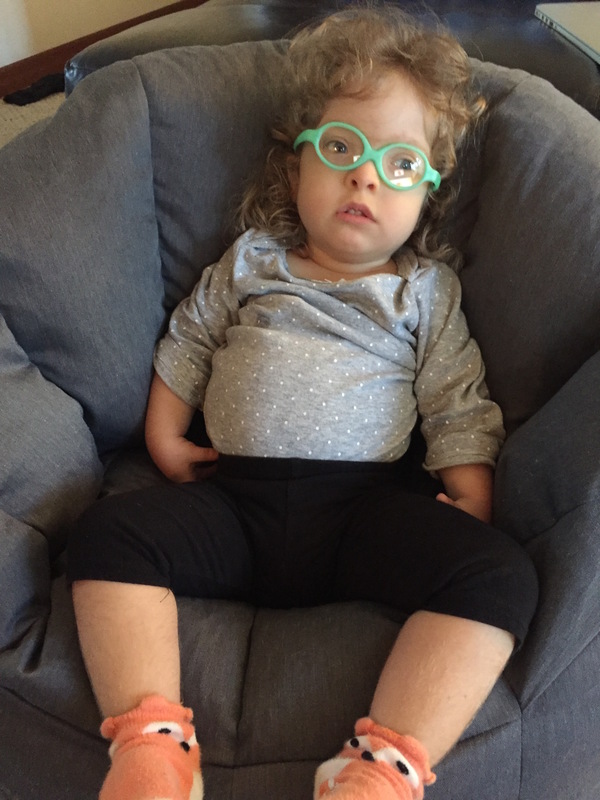 Hazel spends at least 30 minutes a day in a stander, which supports her in a standing position and allows her muscles and bones to get some weight bearing, which is important for her strength and her bone health. She’s allowed to watch TV at this time, and some days she’s more engaged in Curious George than others! Like any mother will tell you, running errands is a lot easier when I have a sitter. Taking Hazel into the market involves either wearing her in a baby carrier, or taking her in a stroller if I only need a few items. She cannot sit in a shopping cart by herself, and I have yet to find a solution for a supportive seat in a cart. As she gets heavier, this is going to have to become a priority! Our evening routine is very similar to a typical family’s. I feed Hazel pureed food and give her a bath. She gets an evening bottle and goes to bed at 9 pm. We read a book and sing a lullaby. Often, it takes Hazel an hour or more to fall asleep, but she’s content to be in her crib by herself. Many nights she still spits up in bed. Often, we check on her and have to change her pajamas and sheets. She tends to sleep through the night, but there’s also times that we check on her overnight and she’s wide awake, but not complaining! I really have no idea how much quality sleep she’s getting at night. This may be due to her sleep apnea, which we will soon treat with a CPAP. Our days tend to be very routine and will likely stay this way until Hazel goes to school. She can start public school exceptional education when she turns three, which will alleviate our childcare expense and my search for adequate child care. I’m not sure I’m ready to send her to school, though! Some days it feels like being stuck in a developmental stage for longer than normal means that life will never change. But I remind myself that Hazel is showing developmental improvements, it’s just at her own pace and in her own time. I get to cuddle with my “baby” for much longer than most parents, which is one of the blessings I try to count every day. This entry was posted in Uncategorized on February 21, 2016 by Carrie. Thank you for sharing. I see so much of our granddaughter in Hazel. Your spirit resonants in your article. Positive thoughts for Your and Hazel’s journey.